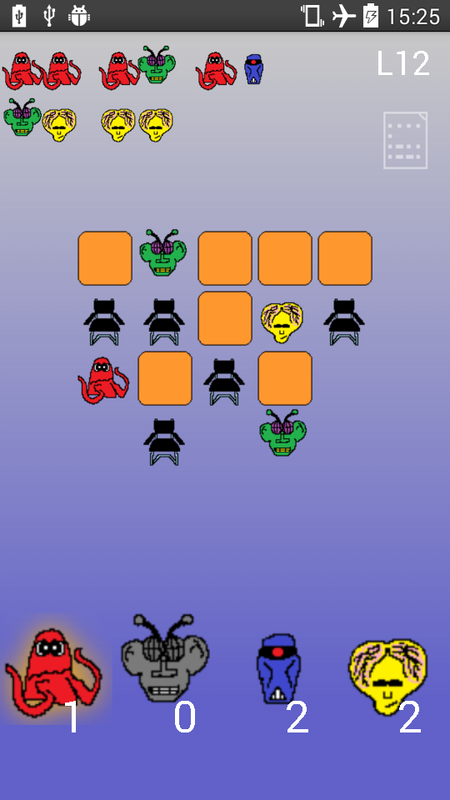 A mildly black humored 47 level puzzle game about politics in the far future challenging your logic skills. I recently made updates to both HTML5 and Android version: Small change to title image, other gradient which is easier on the eyes and replaced all the original TE PO 20 Arcade tracks (except title "track") with some of my sunny and relaxing Novation Circuit tracks. Requires Android version >= 2.2. Android is all touch, HTML5 is all touch or mouse. In Android you return to a previous screen using the phone back button, in HTML5 version you touch/click the exit field in the upper midst or if there were no selections to be made in the screen, anywhere in the screen. Alternatively you can also press keys B or Backspace or ESC on the keyboard. 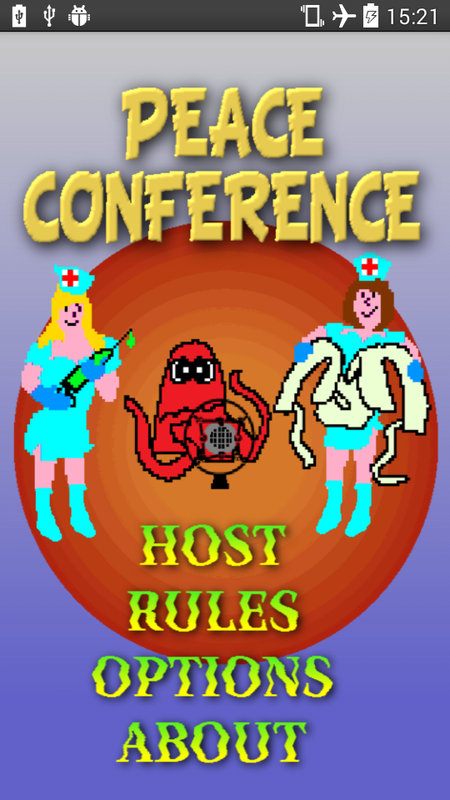 You host the inter galactic peace conference on planet phlegma. The participants are quarrelsome, psychotic alien politicians of four different species. Your job is to assign each participant a chair in the conference room such that they do not freak out and the conference ends in a success. You are now standing at the gates of hell, the conference room, awaiting the delegations and reading the scribbled notes your research staff provided. These notes list in detail which species dislikes which other species and must therefore not be assigned neighboring chairs. These are called chair rules. There may be several of these rules applying in a level. In addition it may be mandatory to place specific species together at each table to achieve an overall pacifying effect in the room. This is called a table rule. There may be zero or one in a level. Of course chair rules still apply at tables. 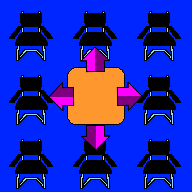 A chair may have up to eight neighbored chairs. Its important to note that even chairs diagonally beside each other are neighbored. 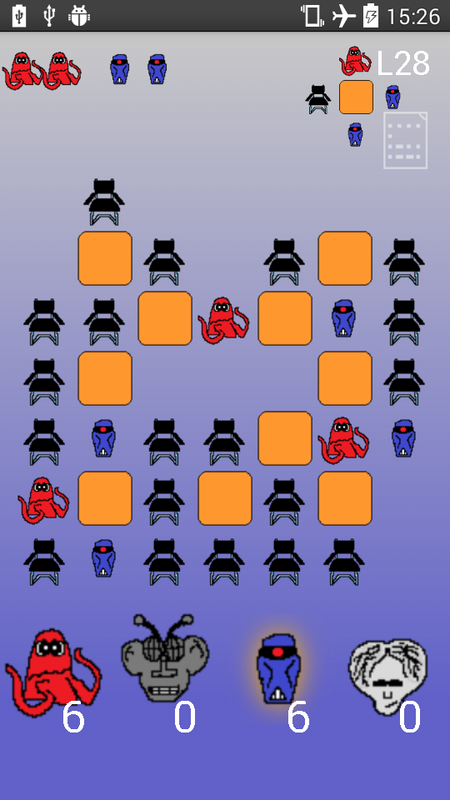 The upper left of the screen lists the chair rules as pairs of alien species WHICH CANNOT BE SEATED AS NEIGHBORS without raising hell. Note that a species may dislike its own kind. Then the pair consists of the same species. The left image below shows a violated chair rule: Red and green aliens are not allowed to sit on neighbored chairs (we do not display the chairs under the aliens, they must be seated). In the right image the rule is fulfilled. 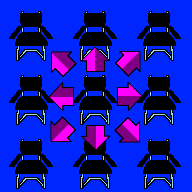 A table may have up to four chairs: A chair to the left, to the right, above and below the table. A chair diagonally neighbored to a table is not associated in any way with the table. 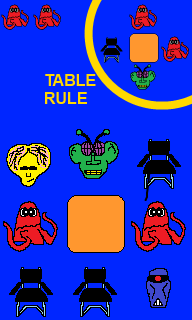 If a table rule applies to a level, the upper right of the screen depicts it as a table with alien species. There is only up to one table rule for a level and it must be fulfilled FOR ALL TABLES in the level. 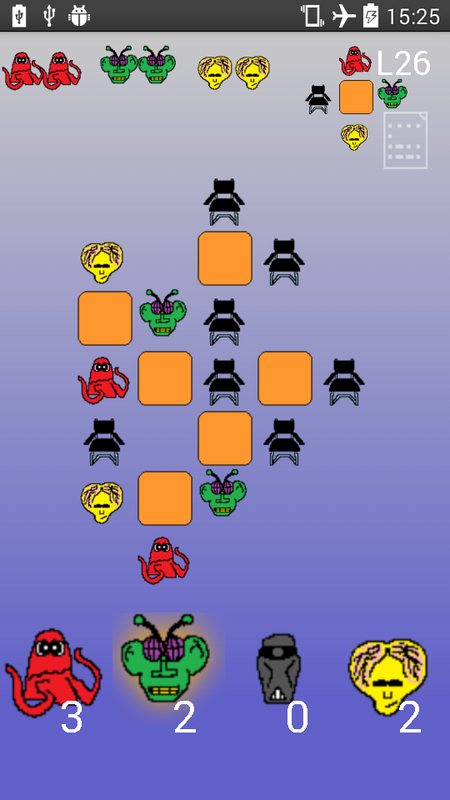 The aliens can be placed in an order different than the depicted but their numbers must match. 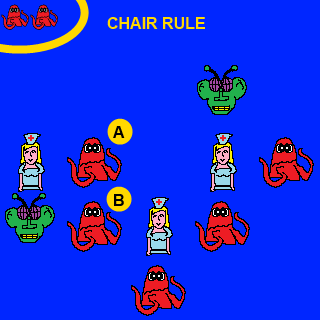 If the rule depicts an empty chair, a table is also accepted in its position (note that tables may be adjacent in this game). 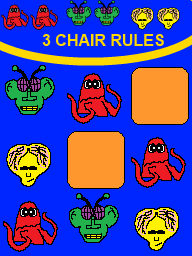 The image below shows fulfillment of a table and a chair rule: The table rule is "at each table two red and one green alien must sit, the fourth chair at the table must be empty or another table". 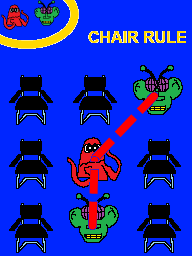 The chair rule is "two red aliens are not to be seated on neighbored chairs". If two chairs are diagonally neighbored and two tables form the other diagonal, then the diagonal of tables is said to be separating the two chairs and NO chair rules apply with respect to this pair of chairs. If you think this rule is illogical, consider a participant trying to get hold of another to settle an argument. With this border of tables in place, its easier to withdraw for the other. In the example below this rule was put to advantage to fulfill three chair rules: "Red/red, green/green and yellow/yellow are not to be seated on neighbored chairs". 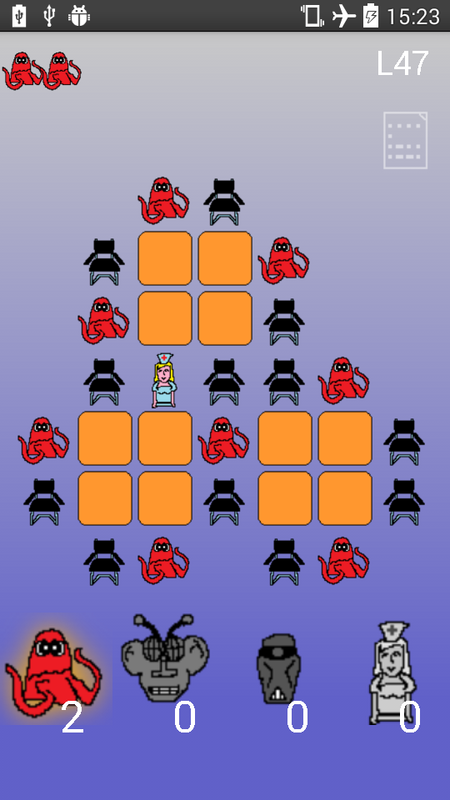 In a number of levels your are assisted by a staff of therapists which pacify the aliens such that these do not freak out even when a chair rule is violated. The therapist has this effect only on aliens seated left, right, above and below of her. These are said to be in her effective range. Two aliens for which a chair rule is violated and which are not in the effective range of the SAME therapist will not be pacified. Of course all therapists must be seated. 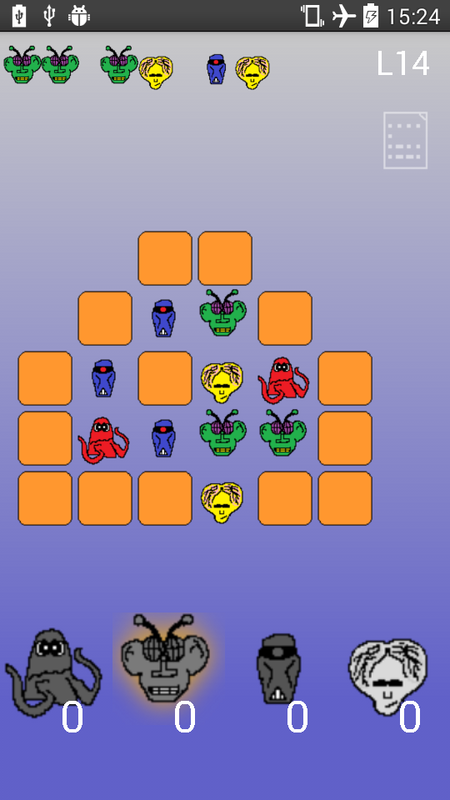 In levels where they are present, they replace the fourth alien species (the yellow brains). Also liked by everyone, the therapists may still be subject to chair rules, meaning, they must avoid species which behave indecent (e.g. cannot keep their tentacles to themselves). Therapists do not affect (alter) table rules in any way. 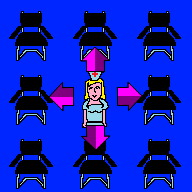 Below is a more complex example of a violated chair rule in presence of therapists: The red aliens (A) and (B) violated the rule because (A) is in the effective range of the left therapist, (B) in the effective range of the middle therapist. To be pacified A and B would have to be in the effective range of the SAME therapist. This rule is grounded in reality as two therapists cannot coordinate their efforts to pacify politicians. 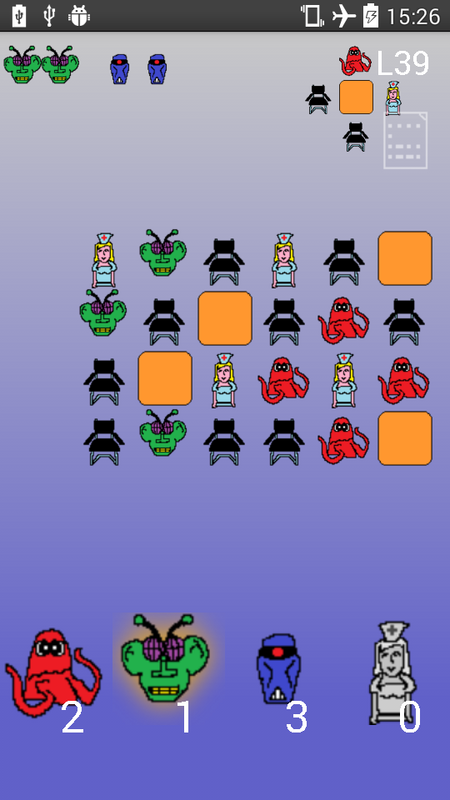 Easy, just as in a drawing app: You select a color at the bottom by touching one of the aliens (or the therapist) at the bottom row. Then you touch a chair to seat an alien of the selected species. The number states the number of delegation members that still must be assigned a chair. To remove a member from a chair, just touch it and it will be removed and the counter incremented. The rules can be viewed by selecting "rules" from main menu or, within a level, by pressing the document icon in the upper right. 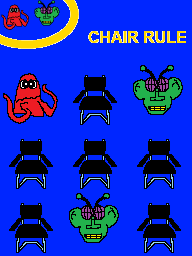 The game recognizes when all aliens (and therapists) were assigned a chair and all rules were fulfilled. 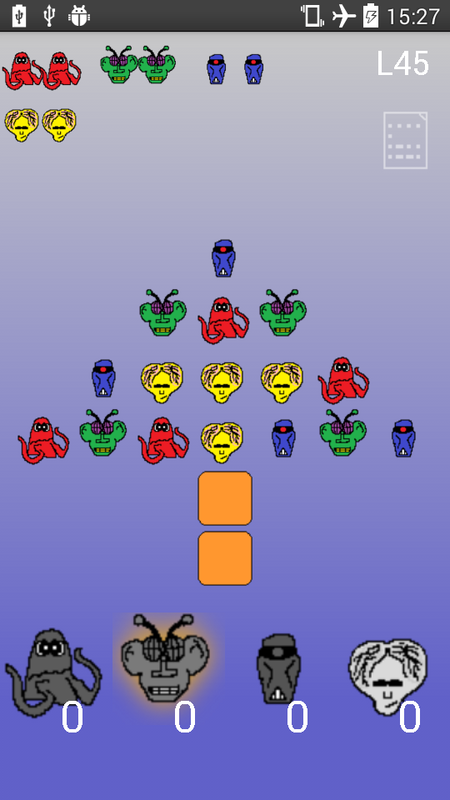 Then the level ends automatically with hymns and praises. If all aliens (and therapists) were seated and nothing happens, then a rule is violated. The game knows which one(s) but will not tell you. This reflects reality: Its your mission and there is no one supervising your decisions. The author thought out the game and levels, no generators were involved. For most levels there is more than one solution because of symmetries in the playing field and the rules and the game will detect every possible one. If you think a level is unsolvable, find the solutions here. I consider this my best game, by a large margin. Quite surprising isn't it ? This is the only game I have some first hand feedback from players. The only "hurdle" is, reading the rules description is mandatory. Do not try to reverse engineer the rules from playing. Reason is, in the game you have to lay out a solution, then a level is solved. If you lay out a non-solution, nothing happens. Then you have to rethink and refine until you found a solution. If you do not know the rules a priori, you will probably not know what you made wrong. This point was once criticized by a user who wanted the spots where there are "collisions" highlighted. Valid point, all agreed. The reason I still made it the other way is the fun associated with deriving where the mistakes are. First you might accuse the game of not accepting your presumed perfect solution until finally, with joy, you spot your own bugs. Note that the difficulty level is rather friendly, meaning, if you are awfully clever, it might not be challenging enough. Hopefully even in that case it is entertaining.